The Universal Flip PDA case allows you to stay organized while supporting your favorite team. This officially licensed PDA case is designed with 1 main pocket to safely hold your PDA as well as a larger slot that is convenient for holding personal items. 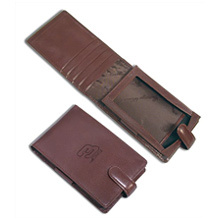 The stylish PDA case is equipped with a pen loop and 4 slots to hold business cards or credit cards. The front cover proudly displays the team logo.